Cambridge Housing Society development of a small scale affordable housing development in Cambourne (35 dwellings, 1ha site). Sustainable drainage features included in design and construction, permeable paving, detention basins, swales, green roof demo, water butts. Growing pressure for new housing in the UK. Cambridgeshire a key growth area under the government's housing strategy, with up to 50,000 new houses planned to be built by 2016. The Water Framework Directive has a target of good quality ground and surface water by 2015. It is also a relatively low-lying county where flooding in river valleys and urban watercourses is a major concern. The area is susceptible to combination events - where pluvial, fluvial and tidal flooding can occur together. There is also a high water table and a layer of impermeable clay, both of which contribute to the flooding risk. 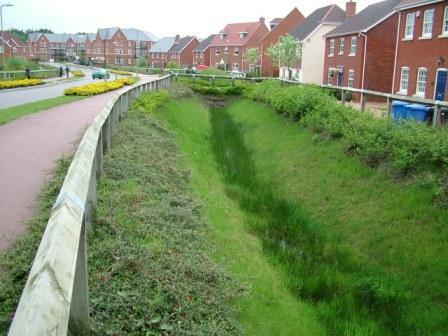 Generally, SUDS can bring reduced risk of flooding, replenished groundwater levels, new habitats for wildlife, cost savings, reduced water consumption and improved water quality returning to the cycle. Cost savings – for development and for householders (no storm water drainage charges).